^ Ellis, Phyllis (2000). Desert Governess: An Inside View on the Saudi Arabian Royal Family. London: Eye Books. ISBN 1903070015. ^ McDonald, James Joseph, and J. A. C. Chandler (1907). Life in Old Virginia; A Description of Virginia More Particularly the Tidewater Section, Narrating Many Incidents Relating to the Manners and Customs of Old Virginia so Fast Disappearing As a Result of the War between the States, Together with Many Humorous Stories. Norfold, Va: Old Virginia Pub. Co.. p. 241. ^ 河村貞枝 川北稔（編）「女性解放運動の結社」『結社のイギリス史：クラブから帝国まで』山川出版社 2005 ISBN 4634444402 pp.194-196. ^ Lecaros, Cecilia Wadsö: ヴィクトリア朝のガヴァネス小説, Lund University, 2000. Peterson, M. Jeanne: "The Victorian Governess: Status Incongruence in Family and Society, in Suffer and Be Still: Women In the Victorian Age, ed. Martha Vicinus. Bloomington: Indiana University Press, 1972. 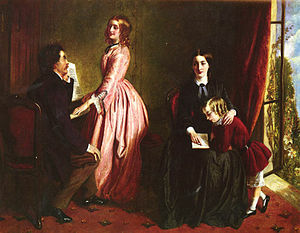 Richard Redgrave's 'The Governess' discussed at the V&A Museum.